Summary: The 2019 version of the Prestige Sports XMPRO treadmill is a smaller machine with a lot of extra features. What stands out from previous generations of this treadmill is the built-in speakers (with Bluetooth) and iPad holder. It does have incline which immediately puts the XMPRO above the very basic models. This is not the biggest or widest home treadmill – though unless you are tall or over 110kgs, it is a popular and robust model. You can see the full picture gallery and feedback from people who already own one over on this dedicated amazon.co.uk product page. This model comes in the standard matt black. It measures 135x65x140cms – making is slightly smaller than the average mid-priced treadmill. Where it stands out is the 14km / hour top speed. Many treadmills in this price range top out at 10 to 12km / hour. While most people will only use the top speed for brief sprints, I do like to see the option. You’ll also get an incline. There are 2 possible levels, which are manually changed (you need to stop running to change it). For automatic incline, you’ll need to get into the higher price points and commercial machines. The 2019 XMPRO has a full 2-year warranty that covers not only the motor, but the frame and parts too. I’m not sure why, but PrestigeSports make a big deal about giving you a fruit infusion bottle with it! The console looks wide and impressive (if a little plastic). There is a big monochrome LCD display with the usual time, speed and calories burned. You’ll also get heart-rate sensors built into the handlebars and displayed on the screen. With a full 17 programs, every form of running is catered for – you can also use this machine in manual mode, increasing and deceasing speed at the click of a button. Speakers and built into the console. You can connect these to your phone or tablet with Bluetooth. A couple of smaller extras to mention, though these can make the difference! There is a towel rack (always good to have a towel within easy reach). You can also fold this treadmill for storage, and wheel is around with small wheels. Ok, on a more serious note, this model has a lot of 5 star and 4-star reviews. Some people did note that it is a smaller model (in fact, one mentioned giving it to their daughter who is the same size as the ‘small’ model on the photo!). That said, the quality of the build did come in for praise from a lot of different buyers. Nobody had major problems fitting the parts together (tools are provided). Noise was mentioned, though did not seem to be a major problem. Only a tiny number of complaints about missing / broken parts. One buyer mentioned e-mailing support and getting a part sent through very quickly. Overall, I’d say a positive reception from buyers – as long as you set your expectation over the size right from the start. Wrap Up: Should Buy the PrestigeSports XMPRO 2019 Dynamic Treadmill? If the free fruit infusion bottle did not have you rushing to the ‘buy now’ buttons, then here is my wrap up. 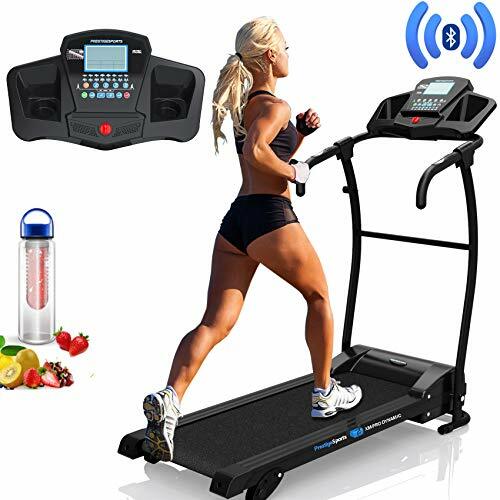 You get a few features which are usually associated with more pricey treadmills. These are Bluetooth speakers, incline and a higher top speed. You also get a robust build and fast service, along with that 2-year motor + frame warranty. At the same time this treadmill is not the biggest / widest in the price range. If you are 6 foot or over, I’d recommend going for one of the JLL Models (for example the S300) instead. All in all, the 2019 XMPRO is a well featured treadmill at a competitive price point. Check out the feedback from buyers and latest price over on this dedicated amazon.co.uk product page now!